I’m a fisheries officer based in the North West, within the Environment Agency’s Greater Manchester Merseyside and Cheshire fisheries team. I’m currently working with the Angling Trust alongside their local enforcement manager to set up the Voluntary Bailiff Service in the North West. Many of you will have already heard about the scheme that’s been piloted in southeast England over the last few years. The Angling Trust is increasingly working with us to help us clampdown on illegal fishing. Thanks to this partnership, the Voluntary Bailiff Service is now being rolled out, to protect coarse and trout fisheries across England. Earlier in the year we had a training session near Rochdale for more than 20 volunteers in the North West. Angling Trust bailiffs are unpaid and rigorously vetted before they are selected. Successful candidates receive an intensive training course on what is expected of them and this is where I come in. In recent months, I have helped train our local volunteer bailiffs. We train them on fisheries law, signs of illegal fishing and what to look out for on the bank and how to record information in a way that could be used as evidence. There are several phases to the Voluntary Bailiff Service. To begin with, Angling Trust volunteer bailiffs are simply ‘eyes and ears’ on the bank, they are not expected to challenge anyone. Their sole purpose is to gather information on illegal fishing and make it available to us via a secure website. This information is then assessed and used by our Environment Agency bailiffs, giving us the ‘intelligence’ to target our enforcement efforts towards places where suspicious activity has been seen. This forms the basis of a strategy which is known as ‘intelligence-led’ enforcement. This is helping to catch, disrupt and deter those wanting to fish and take fish illegally, as some of the results in my catchment area have already shown. With around 130 volunteer bailiffs operating across England, this really will extend our enforcement reach. Subject to the outcome of a further pilot scheme in the south east, volunteers that have demonstrated a strong commitment to the scheme and have the necessary skills, can apply to progress to the second phase. If successful – and following more specialised training in conflict resolution and using legal powers – they will be issued with a warrant and the equipment to check rod licences. 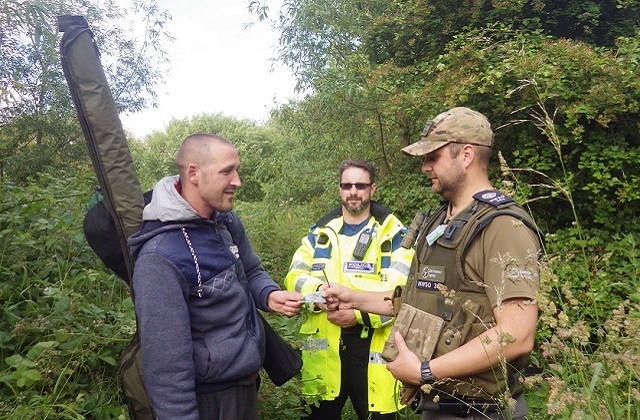 In the southeast pilot, we have appointed 11 volunteer bailiffs, who will be working alongside our officers for a probationary period, and then independently in pairs, checking licences and other angling offences on our behalf. Would contact details for the Angling Trust be helpful? Hi is the balliffing scheme going to be available in Wales. Is this scheme going to come to Wales? I would love to become a volunteer but do thay do it in South Wales, please can you get back to me please. The Angling Trust work in partnership with the Environment Agency giving opportunities for their members to volunteer as fisheries bailiffs. This scheme covers the whole of England and is strictly limited to members of the Angling Trust.